Ahhhhh so begins the major FOOD HOLIDAYS and what a deliciously devilish way to begin! Halloween is one of my most favorite Holidays… and yes I have categorized it into a major food holiday along with Thanksgiving, Christmas and New Year. Why? Because I believe you can still be a kid at heart and celebrate Halloween with an adult meal. So while the kiddos are getting ready for Trick-or-Treat and you’re busy handing out candy, invite some friends over and have a creepy dinner! Mix well and pour onto the chicken wings. The perfect sweet citrusy and peppery glaze! Marinaded over night and ready to roast in the oven! Rinse and pat dry the chicken wings then place in a 1-gallon plastic baggie. In a mixing bowl combine the other ingredients (except the Jezebel Sauce) and mix well into a marinade. Pour the marinade into the plastic badge with the chicken wings. Seal tightly removing any excess air, and lay flat in a 9x13 cake pan or on baking sheet pan. Place in the refrigerator and marinate overnight. When ready to cook Preheat your oven to 425 degrees (I set my oven to the ROAST option). 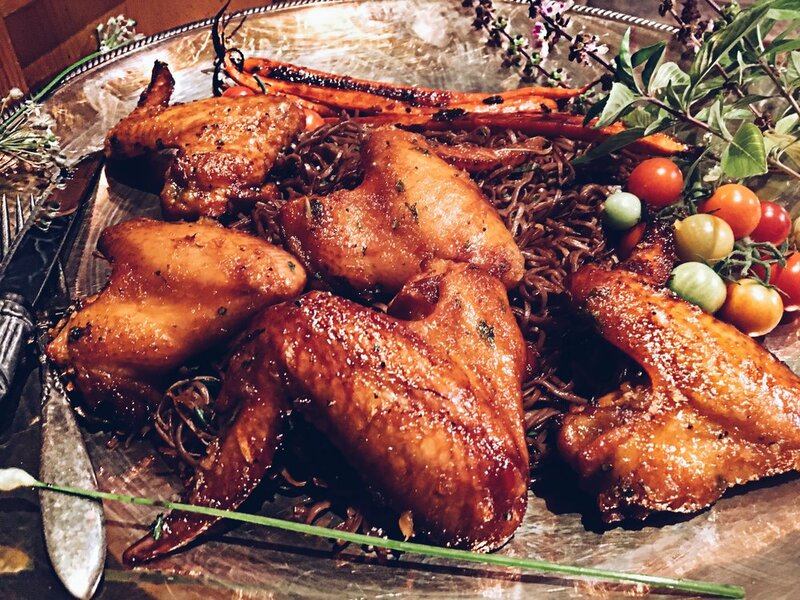 Remove the chicken wings from the marinade and place on an oiled (cooking spray) wire rack large enough to hold the wings and one that can fit on a large baking sheet tray. Spread the wings out evenly. Strain the marinade through a strainer reserving the liquid and tossing out the strained solids. In a saucepan pour in the marinade and bring to a boil then turn down to a gentle simmer. Reduce the marinade 3/4 to a nice syrupy basting liquid*. Place the wings into the oven. After 25 minutes baste the wings with a basting brush and continue cooking another 10 minutes. Glaze the wings with In The Kitchen With Scotty “Jezebel Sauce” cooking an extra five minutes until the glaze has caramelized and is bubbling. 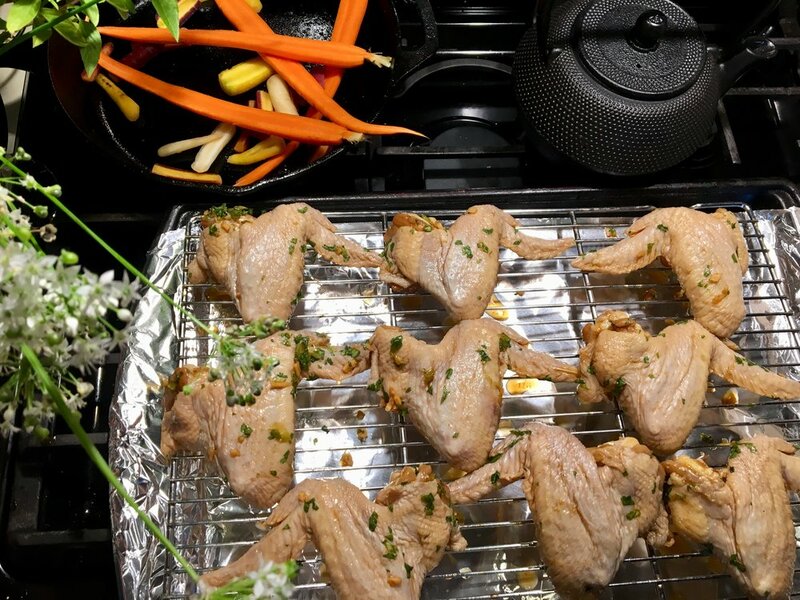 Remove the wings from the oven and let them rest before serving about 5 minutes. * YOU MUST COOK AND REDUCE THE MARINADE TO PREVENT FOOD BORN ILLNESS FROM RAW CHICKEN... I mean it's Halloween and all, but don't get crazy. Perfectly roasted and golden brown! Bring a pot of salted water to a boil and add the Soba noodles. Add oil to the water to help prevent bubbling over. These noodles will cook faster than spaghetti, about 10-12 minutes or until al dente. Drain and set aside. IN a cast iron skillet or heavy fry pan begin to heat up 2-3 tablespoons of Grapeseed Oil along with the red pepper flakes. Quickly add the garlic stirring around to fry but not to brown. Drain the soba noodles shaking off any excess water and immediately transfer to the fry-pan. Toss the noodles around in the hot oil and pepper making sure that each noodle is properly coated. Toss in the chopped Thai basil and garlic chive. Soba Noodles cooked and ready for frying!